LOS ANGELES — If you’re like me, you love the look of a photo book, but hate the hours it can take to get them made on the computer with sites like Shutterfly and Blurb. The promo for mobile app Chatbooks looks like it was directed to me. “Stop wasting hours making photo books. This one takes 1 minute." Intrigued, I dove in to the world of mobile photo book creation this week. Good news: this holiday season you can zip them out much more quickly via mobile apps, and the process is far simpler. With fewer options and a smaller mobile footprint, the creation process is a breeze, and the best of the apps let you pull pictures from your smartphone and social networks like Facebook and Instagram. But that’s changing, as recent smartphone cameras have better optics. Look for bigger albums from mobile apps in 2017. We decided to test Laffoon, Chatbook and others at their word. Is it really quicker to make albums on the smartphone? We pulled together five mobile app photo book/creation tools, from industry leaders Shutterfly and Blurb, to newcomers like Mixbook’s Mosaic, Simple Prints and Chatbooks. We didn't pull the trigger on buying from all 5--this is a review of the creation process. However, we've ordered from Shutterfly and Blurb many times over the years, and always been very happy with their work. Plus, Mixbooks and Chatbooks sent us samples that looked surprisingly professional, sturdy and shareable, despite their small size. Surprisingly, Apple, which produces photo books on desktop through its Photos app, doesn’t offer a mobile solution nor does HP’s Snapfish. In a nutshell, you open any of the apps mentioned, collect photos and start laying them out. Some let you change the order and add text and captions if so inspired. Shutterfly: The No. 1 photo site gives me the biggest headache in album design on the computer, with over 200 different layouts and options available. I just want simple — one picture per page, in a consistent size, please, and I struggle through slow software, automatic choices that often get it wrong and too many options to get to simple. But in the Shutterfly mobile app, you choose a size for the book, collect photos from the Camera Roll, Shutterfly, Google Photos, Facebook or Instagram, and they are then laid out. That’s good. Not great — each has different layouts on each page. If you don’t like that, you need to go in, one by one, and change the layout. You can change the order of the photos by clicking the photos tab and moving them around. The books start at $29.99 for an 8x8 hardcover. VERDICT: better than Shutterfly’s desktop software, but inferior to rivals. Blurb: The choices here are strictly from your smartphone camera roll, which works out to fewer options than rivals. You select a minimum of 20 images, and they’re automatically laid out, full bleed, onto square layouts. Use your finger to change the order and choose the image for the front cover. Books starts at $29.99 for 20 pages of photos in a 7x7 square hardcover. VERDICT: Zippy process, and Blurb makes beautiful books. But no Facebook or Instagram? No thanks. Mosaic. 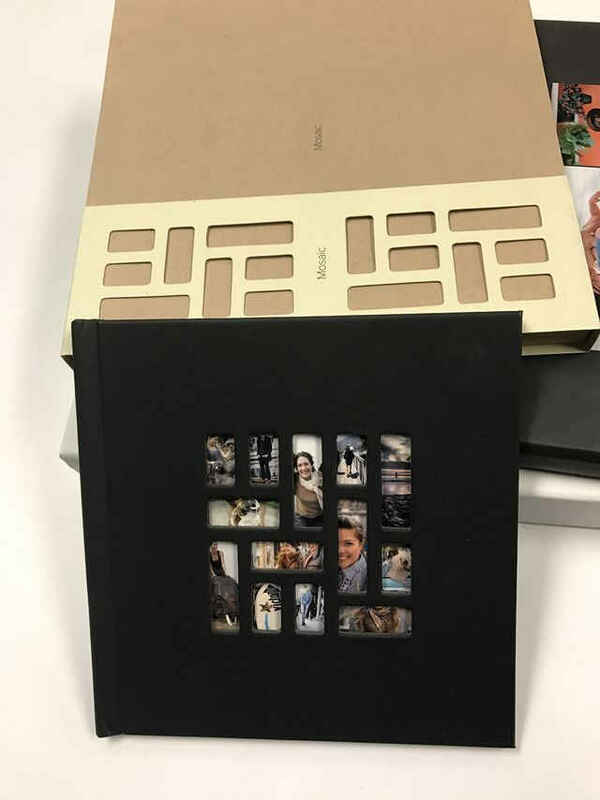 The offering from Mixbooks is different: 20 images (from Camera Roll, Facebook, Instagram, Snapchat, Smugmug, Amazon and Dropbox,) in a 7x7 book, with a 13-image Mosaic of small images on the cover. You can’t change the order, but you can shuffle the pictures on the cover. Very few decisions need to be made. The books are $25. VERDICT: If it’s speed you like, this is as quick as it gets, under 30 seconds. Works as advertised. Simple Prints advertises itself as “the simplest book you’ll ever make,” which is debatable. Mosaic was drop-dead easy too. The company does have the best interface of the bunch, letting you see your choices on the pages, and move them around to your like. The 8x8 hardcover is $29.99, with extra pages at 50 cents a piece. VERDICT: As quick as Mosaic, and you get control of your cover photo. Chatbooks. The most economical and innovative of the bunch, Chatbooks start at $17 for 60 square images in a 6x6 hardcover book, with photos from your Camera Roll, Facebook, Google Photos or Instagram. There’s also a subscription offering, at $8 for a new book every time you take 60 new photos that get posted to Facebook and Instagram. No design time is needed, and shipping is free. VERDICT: Speedy, simple creation process, with photos from many sources, but changing order of photos cumbersome. Love the hard copy collection of my social photos.